Leicester director of rugby Richard Cockerill believes other clubs are offering big money to Manu Tuilagi. The England centre, 24, whose deal at Welford Road runs out next summer, is attracting interest from several sides. "We are having some very positive discussions with Manu and and we are very positive about him staying here," Cockerill told BBC Radio Leicester. "Manu is world class. Clearly people are trying to lure him to smaller clubs by offering him huge amounts of money." Reports had suggested Tuilagi had been offered £1.6 million over three years by Worcester Warriors, although Warriors director of rugby Dean Ryan said on Wednesday there was no truth in the claims. Wasps director of rugby Dai Young also said his club have made no move for the England centre, but Saracens, Bristol and Toulouse are also thought to be interested. 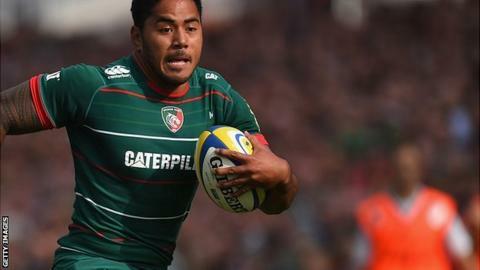 Samoa-born Tuilagi, who joined Leicester as a youngster and has since won 25 caps for England, has been offered a new deal by the Tigers. "I didn't think other clubs were allowed to speak with him until 1 January, so that surprises me," Cockerill added. "Manu is a sensible lad and I am sure we will come to a sensible conclusion and all indications are that it's the case. "I am confident that Manu will stay. He has a lot of rugby left in him. "He is a good lad. We have looked after him very well and we are confident he will stay a Leicester player."